How To Make A Pinata? and knick-knacks. The pinata is a colorful figure that we garnishes with sweets . If you do not want to buy, it is quite possible to make yourself pretty pinatas… And we immediately shows you how! So, How to make a Pinata? Don’t worry, make a piñata at home is not difficult. However, you need a discreet place to hide your masterpiece for a few days, the time it dries. A place away from the small snoops so that at the D-day , you will make them a very nice surprise. An inflatable balloon: choose one that is very solid and extensible. Indeed, your balloon should not break or deflate during frequent handling. Old newspapers: you can also choose layers of tissue paper. Glue for wallpaper: you can buy. Alternatively, you can make it yourself. To do this, you need water and flour that you whip well . It is a rather messy work, then it is better to work on a vinyl tablecloth that will be easy to clean. Also wear a washable apron. Start by inflating the balloon. Knot the end and then hang it between two chairs with a string. Then, prepare your glue. For this, take a pot, and put in a cup of water and a cup of flour. Put the pan over a low heat and mix the contents. When the glue has taken, remove the pan from the heat and let it cool down. Now take the newspapers. 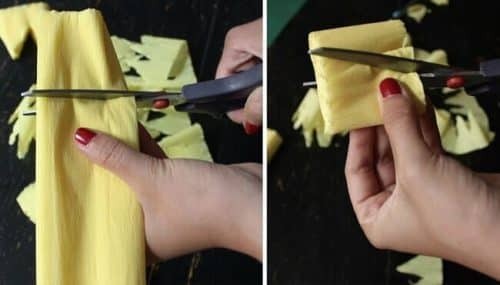 Cut strips with which you cover your balloon. But first, dip in glue. When you cover the balloon, let a big enough space around the node. This will be the opening of the piñata by which you are going to fill it. When it’s done, let dry the piñata for at least 24 hours in a well-lit place. You can also use a hairdryer. 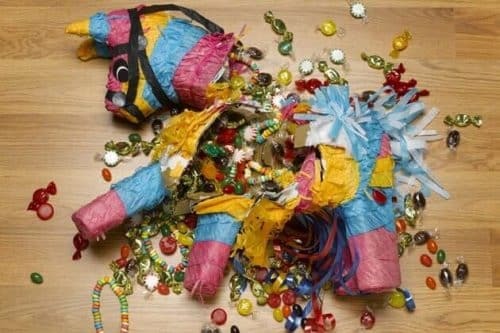 The next day, you will have a hard pinata. Take the needle or the pair of scissors to drill the balloon. After remove it. If you want to retrieve your balloon, deflate it just by loosening the cord. Now, you can work on the decoration of your masterpiece. 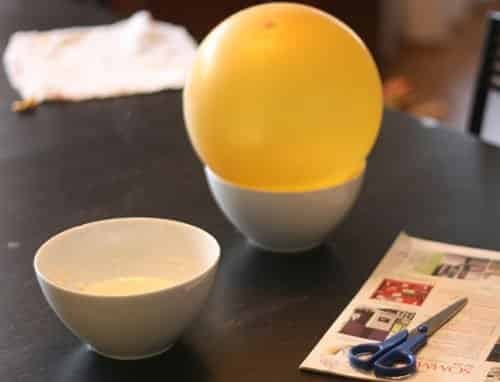 To do this, tape it on a bowl, head upwards so that you can more easily manipulate. You can paint your pinata with different colors, or decorate it with different coloured crepe papers. Use a stapler to staple the Ribbon. Another idea is also to affix on your piñata animals stickers, Comic characters… This will make a nice effect. You can choose what may appeal to your child. When the décor step is made, fill your pinata with candies and small toys: action figures, rings, earrings, chocolates… and presto, your piñata is ready, there is more to suspend it! A piñata made with cardboard ! 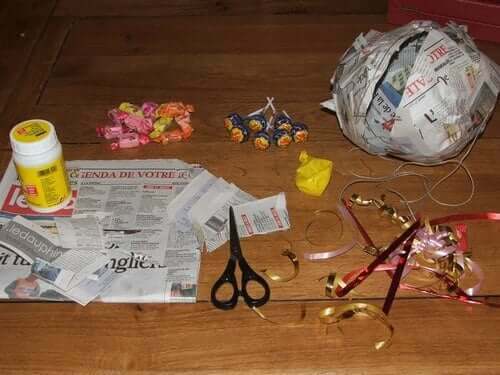 If you have earlier used the balloon to make a pinata, you can also do it with cardboard. And there, the opportunities are very wide. 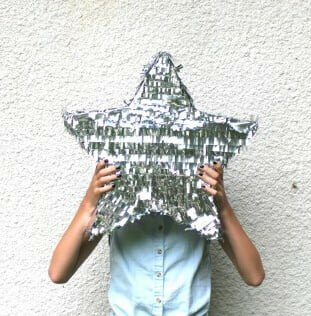 You can make a boat pinata for your boy, a beautiful castle pinata for a little girl, a pinata in the shape of giant star, Crown-shaped, of ice-cream… Everything is possible, your imagination is your only limit. Start by drawing a star on the first sheet of cardboard. Cut it. Reproduce this form the same way on the other sheet by routing the shape with the pencil. Then, cuts several bands about 3 In thick with the rest of the cardboard. Attach them around the first star with tape. Take the other Star and glue it on the strips. 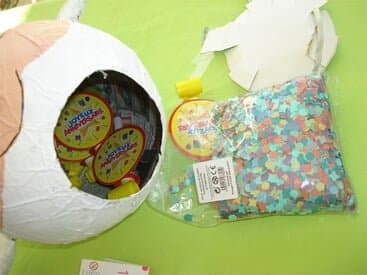 Before completely closing your pinata, insert candies, small toys and confectionery. Now, this is the step of the decoration. Take the crepe paper and cut in section of about 2 in . Make the fringe. Then glue them on the star cardboard. First the bottom, then gradually go up. Continue this way on the other side and finish with the sides. And voila!, your Silver Star is ready!